With Halloween fast approaching, here is my pick of the five most haunted hostels across the world... to suit all spooky tastes. Castles, pirate bases, brothels and old prisons may not guarantee the best sleep, but will certainly provide you with an unforgettable stay. In Ireland, there are apparently lots of ghosts and ghouls around the rural setting of Captain Halpin's Bunkhouse, and the hostel, located in Wicklow, organises special evenings out to go hunt them down. This year, especially for Halloween, there's a Murder Mystery night on the Saturday for all guests and on Monday 31 October they're throwing a traditional Halloween party with apple bobbing and scary story time by the fire. Wicklow's main square is set to turn into a Halloween Haven and the local gaol is even putting on a Halloween Horror Week. Dorm rooms start from $16.60 pp pn. Loch Lomond Youth Hostel in Scotland is an impressive country house set in the Loch Lomond and Trossachs National Park, with stunning views of Loch Lomond and hills to the east. Guests can feel the ghostly presence as they walk around the grounds and the hostel is said to have its own ghost in permanent residence. The original features of the beautiful building - a sweeping staircase, stained glass window and ballroom - make it look like the perfect setting for a ghostly film. Dorm rooms start from $26 pp pn. While it may appear tranquil and serene on the surface, 7 Santi ancient monastery is located in the very heart of Florence, home to the infamous poisonings and treacheries of the Borgia family. It certainly gives the Halloween holiday a rather macabre edge. Some also say they have heard the whispers of souls trapped in the 7 Santi convent walls at night. Dorm rooms start from $16.60 pp pn. In Transylvania, guests can't get much spookier than staying in Nathan's Villa Hostel. 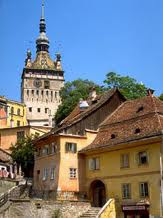 It is right in the heart of Count Dracula's home town and next to the UNESCO World Heritage listed Sighisoara Citadel. 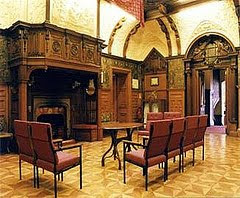 The castle is the only one in the world with people still living inside. The actual Nathan's Villa Hostel building is 100 years old - giving it plenty of time to soak up the ghosts and ghouls in the spooky surroundings. The hostel offers lots of trips into the surrounding area, including the 800-year-old oak forest and hiking into the hills. Dorm rooms start at €12 pp pn. In San Diego, USA Hostels, located near a range of bars and restaurants in the heart of the Gaslamp District, is renowned for housing a brothel in the late 18th century. 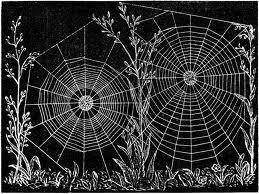 It is common to hear stories about the lights going on and off without reason, unexplained breezes and more. Also, if you happen to be a fan of old western gunfights at the Ok Corral, this might be the best place for you! It's said that the ghost of Sheriff Wyatt Earp still wanders around seeking revenge for his friend Doc Holliday. Dorm rooms start from $23 pp pn.